If you have some money and are looking to make it grow, it’s important to take some time and figure out what your major options are before beginning. This way you can identify, and then avoid, the common pitfalls. Whether you’re looking into how to invest money for the first time to start making it grow, or you’ve done it before and are looking to invest new capital with some new ideas, this guide will help you get started. With the immense power of long-term exponential compounding, almost anyone can become a millionaire over time. To invest money means to put your money to work, so that it can grow into a larger amount of money over time. For example, you can save up money to buy a piece of real estate, rent it out to make more money, and then save up that money to buy a second piece of real estate and start renting that out. After many years, your wealth could grow exponentially from one property, to two, to four, to eight, and so on. The same is true for stocks. You can buy small pieces of companies called shares, and those companies are constantly working hard to increase their size and improve their value. Some of them pay cash dividends on a regular basis, and you can either spend them or reinvest them to buy more shares. The annual rate of return of an investment is equal to the amount of money it earns in a year divided by the original investment. For example, if you invest $1,000 into something and it pays you back $80 each year, it’s an 8% rate of return. Some investments like bonds are fairly safe but don’t provide high rates of return. Other investments, like stocks and commercial real estate, can provide high rates of return but with more risk and volatility involved. For example, if you earn an 8% return per year over a period of 30 years, you’ll have ten times as much money as you put in. This guide focuses on investing in stocks and bonds, because they are accessible to just about anyone. Investing in stocks is one of the most reliable ways to build wealth, and yet, most people encounter a lot of pitfalls. They sell stocks in frustration after the market has already fallen, they buy stocks with excitement after the market has already surged upward, and they waste money on paying high fees to people and companies that don’t deserve them. It goes to show that even chartered financial analysts and people with Ivy League MBAs still usually make mediocre professional stock pickers compared to simple low-cost index funds. That’s because stock-picking is a zero-sum game, and only the very best can consistently outperform. Before fees, most fund managers approximate the market return, but after fees they underperform. To make matters worse, investors usually miss out even when they invest in the best actively managed funds. For example, one of the most successful actively managed funds ever was the Fidelity Magellan fund, managed by Peter Lynch between 1977 and 1990, which absolutely crushed the market during his tenure. The problem is, his best results were in the beginning, when hardly anyone was invested. And then when people started to notice and began investing towards the later, slower-growth period of the fund, they would still pull their money out whenever the fund hit a speed bump. During his tenure Lynch trounced the market overall and beat it in most years, racking up a 29 percent annualized return. But Lynch himself pointed out a fly in the ointment. He calculated that the average investor in his fund made only around 7 percent during the same period. When he would have a setback, for example, the money would flow out of the fund through redemptions. Then when he got back on track it would flow back in, having missed the recovery. Many index investors do the same thing. They don’t put enough money in to begin with, and they time the market poorly. 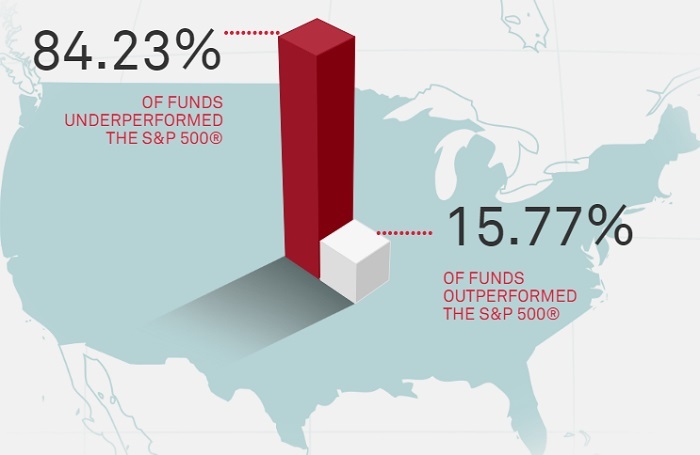 A lot of investors end up underperforming the funds that they invest in. My father was a prime example. He sold all his stocks in his 401(k) at low prices after the recession in 2002 and stayed in cash. The end result was that he locked in his losses by selling at the market bottom (when he should have been buying more), missed out on the recovery, and never invested in stocks again. Years later, having stayed in cash the whole time since then, he never fully recovered his net worth from that mistake. Fortunately, you don’t need to be the smartest person in the room to do well with your portfolio. Sure, you need a solid grasp of basic math, but beyond that, successful investing is more about managing your emotions and looking at good evidence for what works, rather than relying on raw brain horsepower. There was a great article published by The New York Times back in September of 2016 called, “The Difference Between Rationality and Intelligence“, which describes this point excellently. The summary of that article is that rationality and intelligence are different from each other, and not very strongly correlated. You can be rational without being particularly intelligent, and you can be intelligent without being particularly rational. There’s only a weak correlation between them. In this context, intelligence is like raw horsepower in the brain. How quickly can you identify a pattern in a series of numbers, or grasp extremely complex mathematics? That’s raw IQ, raw intelligence. For the most part, we can’t really change this; we have to work with what we’ve got. Rationality, on the other hand, is mainly about being resistant to logical fallacies. It’s about critical thinking, and about being able to take a step back and examine our own thought process to identify and correct the faults in our way of thinking. Unlike intelligence which is largely set in place by the time we are adults, rationality can be learned and improved. Studies have shown that by learning the various logical fallacies that humans are prone to, we can improve our ability to identify and avoid them. Successful investing, most evidence seems to indicate, is more about being rational than intelligent. You don’t need a ridiculous IQ, but you do need to be able to detach your emotions from your reason, and be able to identify when you’re doing something irrational with your money. In that sense, being an intelligent investor actually means being a rational investor. There are two smart ways to time the market. The first method is to simply ignore market timing altogether, and invest money in a balanced portfolio every month like clockwork. That’s the simplest and most reliably way to go about it, and the best strategy for most people. 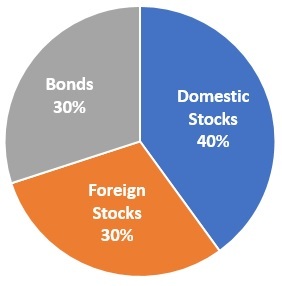 That represents a fairly consensus idea of what a balanced portfolio looks like for a working-age investor. That’s the baseline here. Now the key is to re-balance it whenever one of those segments grows too far out of proportion. When stocks go up during a strong bull market, they will outperform bonds, and your portfolio will be lopsided towards stocks. Conversely, when stocks fall in a market crash, they will underperform bonds, and your portfolio will be lopsided towards bonds. Whenever one of the asset classes rises or drops greatly in price, you re-balance the portfolio to your baseline, which naturally means buying more undervalued assets and selling more overvalued assets. I have 3 sample portfolios that you can check here out as a starting point. One of them is aggressive, one of them is conservative, and one is moderately in between. I also have a good guide on asset allocation, which may help figure out how much of your money to put into various asset classes. The second and more advanced method is to pay attention to the CAPE ratio and other valuation metrics of the market, and try to buy more stocks when stocks are cheap. And more specifically, you cycle assets out of overvalued investments and into undervalued investments, which can include specific market sectors. This is where most investors are irrational; they ignore valuation and become filled with euphoria as the market keeps going higher, and they start putting more into equities then. When the market inevitably goes through a recession or correction, they panic and sell when stocks have fallen in price, locking in their losses. The rational approach is to do the opposite; be a value investor and become excited after market prices have dropped and stocks are cheap, and become cautious when stocks are historically expensive. Right now, for example, we’re 9 years into a market expansion. That’s the second longest market expansion so far in US history, with the longest ever being only 10 years. Concurrently, the CAPE ratio is the third highest it’s ever been, market capitalization divided by GDP is far higher than normal, the official unemployment rate in the US is very low, stock market volatility is low, and the economy is humming along decently. It’s the calm, expensive situations like this when market risk is actually closer to its peak. The rational time to be excited by buying equities was a few years ago when stocks were cheap and well below all-time highs. Now that we’re later into a market cycle with highly valued stocks, it’s time to be conservative. That doesn’t mean to avoid buying equities (I’m still heavily invested myself), but it does mean to pay keen attention to valuation of stocks you do buy, and be prepared for a market correction that could occur at any time, whether it’s this fiscal quarter or two years from now. For most people, the first and simpler method is the best. Just stick to a balanced portfolio, and ride out the storms. A lot of people view the stock market as a casino. You put money in, and you might or might not get it out later, they say. But that’s not how it works, even though there is always a degree of chance involved. To invest money means to buy an asset with a high probability that it will produce substantial cash flow or capital appreciation over time, and grow your wealth. Markets go up, and markets go down, but over the long-run, investing in profitable companies is one of the most consistent ways to build wealth. 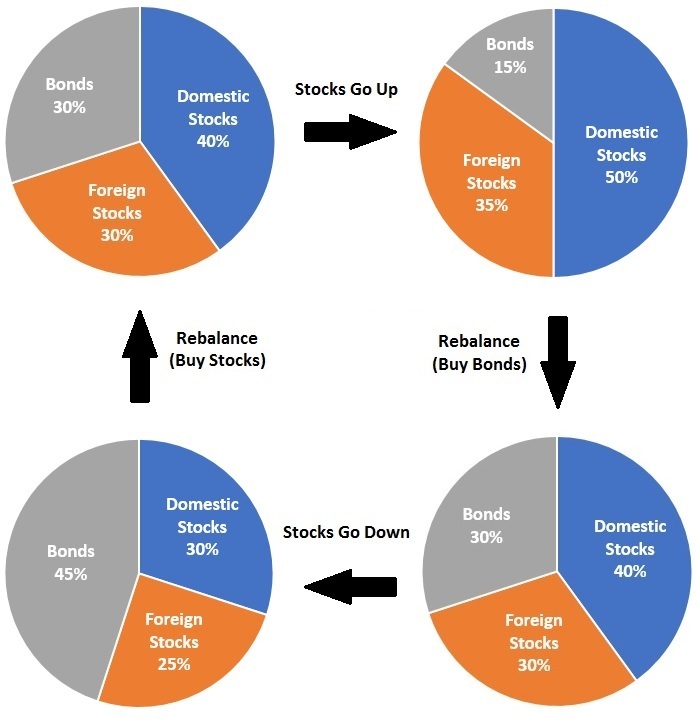 Rounding out those companies with bonds, precious metals, personal real estate, or other asset classes, can make for a suitably balanced portfolio. Performing discounted cash flow analysis, or at least understanding the basics of it, is a good start on being able to differentiate between an investment and a speculation, because it helps you determine the maximum amount of money you should pay now compared to the cash flow you expect to receive over time. Putting money into diversified index funds each and every month. Building and holding a diversified portfolio of dividend stocks. Thoroughly analyzing a company and investing in it for the long-term. Buying rental property for a reasonable price and maintaining it well. Starting a business and putting your time and money into growing it. Putting 50% of your portfolio into a hot tech stock because your uncle said it’s gonna be big. Buying call options, hoping for a multi-fold gain, without any sophisticated options risk mitigation strategy to put the odds in your favor. Using very high leverage in your investment accounts. Taking out loans to invest all-in on Bitcoin or other cryptocurrencies. Changing your portfolio constantly because you think you reliably know what is going to happen in the markets next month. 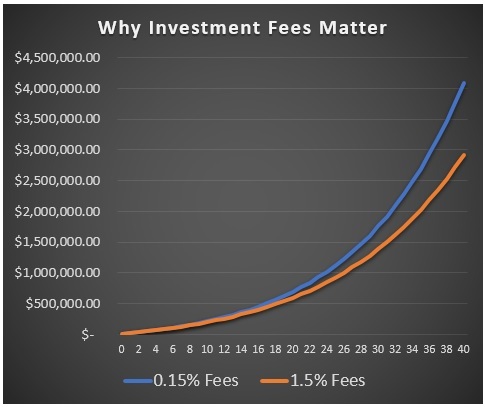 One of the biggest mistakes you can make when you invest money is to pay high fees. I know a lot of people that pay 1% or 1.5% per year in annual fees for actively managed funds, and it’s almost always going to result in a) failing to beat the market and b) having a lower final balance because the fund manager got paid a lot of your money. But hey, what’s a million dollars between friends? If you’re paying any more than a fraction of a percent on your money per year, you really should consider switching to a lower cost solution. That is, unless you’re also getting a full suite of other services, like tax management and estate planning. 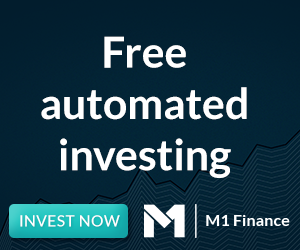 Personally, I think M1 Finance is the best option for most people. It’s free, it’s easy, and it’s automatic, but allows customization for more advanced investors as well. If you’re putting away thousands of dollars per year into your retirement accounts, then any fees you pay can totally derail your retirement over a 30 or 40 year period. Now, if higher fees meant better performance, then it would be a fair trade. But for the most part that’s not how it works, and high fees usually just enrich the people charging them. You’ll find the lowest fees with the largest passive funds. They eliminate the research teams that active funds require. And the more assets a fund has under management, the more they save costs by having a large scale, and so they can push fees to incredibly low levels. That’s not to say that active funds are never a good idea. There are a few decent ones out there, including T.Rowe Price, Matthews Asia, and a few others that have maintained consistent performance, especially if you’re looking to target certain niches. But overall, for most investors for most of their assets, passive index investing is the superior approach. The first step to determine how to invest money is to figure out where you want to put your money. If you’re in the United States, you’ll have a few different type of retirement tax shelters to take advantage of, like traditional and Roth 401(k)s and IRAs, or the TSP if you’re a federal worker. Canadians and folks from other developed countries have other systems. It’s important to keep taxes low. If you’re paying 15-37% of your capital gains or dividends in investment taxes, when you could be paying 0% with a retirement account, then you’re crushing your returns. Paying a 25% tax rate on an 8% rate of return, for example, bumps that after-tax effective rate of return down to only 6%. Over a multi-decade period, that’ll literally cut your money in half compared to what it could have been. If you have an employer that offers 401(k) or TSP matching (or similar solution if you’re in another country), put enough money into that account to achieve full matching. That’s an immediate 100% return on your investment, so even if your employer has a lousy 401(k) provider that charges high fees, it’s usually still worth it. In a traditional 401(k), you don’t pay taxes on the income you put in, and don’t pay taxes annually on your investment gains. Instead, you only pay taxes when you withdraw money. You get to defer taxes and compound your money for decades before paying the government. Next, if you have more to invest, consider setting up and annually maximizing a Roth IRA if you’re under the income limit. A Roth IRA lets you put in after-tax money, and then never pay taxes again on any of your investment gains in that account. Also, Roth IRAs are really flexible; they have a lot fewer restrictions on when and how much you can withdraw from them without penalty compared to 401(k) plans, and there’s no age limit where they force you to start withdrawing from it. A Roth IRA is totally employer-independent. You can open an account on your own, and if you change employers, there’s nothing you have to switch around with your account. Lastly, if you still have additional funds to invest after maximizing your retirement accounts, you might want to open a regular, taxable brokerage account. 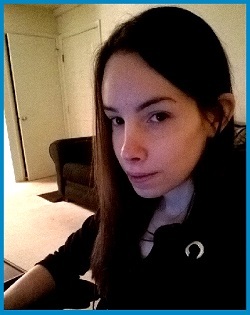 I have mine with Charles Schwab and M1 Finance. There may be times when you contribute to a taxable account even if you aren’t maxing out a 401(k), though, such as if you plan on retiring early. All else being equal, taxable accounts won’t perform as well due to having to pay taxes each year on your gains, but they’re the most flexible. You can withdraw money when you want, you can pick any brokerage or platform, you can invest in anything, and you can begin living off the income at any age. If you want to roll your sleeves up, buying a rental property is another smart way to put your extra funds to work. Knowing what your goals are helps you prioritize your account types. The longest term money, meant for late retirement, should be put in tax-advantaged retirement accounts like 401(k)s. Medium-term money can be put in taxable accounts or Roth IRAs, and can be more easily tapped into if you retire early or need the money at some point. It’s often a good idea to mix traditional and Roth account types in your overall investment strategy. Generally speaking, a Roth IRA or Roth 401(k) is better if you believe your tax rate will be higher in the future. If you’re young and not making a ton of money yet and have a low tax rate, but expect to make a lot more money in the future at the apex of your career, then putting money into a Roth IRA will probably make the most sense. On the other hand, a Traditional IRA or Traditional 401(k) is better if you believe your tax rate will be lower in the future than it is now, such as if you are making a lot of money now and expect to have a lower income in retirement. Truth be told, it’s hard to accurately predict how much you’ll make in the future compared to now, or how politicians will change around the tax rates decades from now. I like to have both a Roth and Traditional account; on one account I pay taxes now and never worry about them again, while in the other account I defer taxes now and will pay them later. That’s the middle-of-the-road strategy. One thing that new investors mix up, is the difference between account types and platform types. For example, they think that a Roth IRA is a type of investment, when really it’s more like a container that can hold various types of investments tax-free. Account types, such as taxable brokerage accounts, Roth IRAs, and Traditional 401(k)s, are just containers that other investments are put in. They hold stocks, bonds, cash, options, gold, and so forth, rather than being investments themselves. After you determine what type of account you need, the next step is to figure out what types of investments to fill it with. This choice of which platform to go with is important to know up front, because it determines what kinds of investments you can pick down the road. Some platform selections will limit what kinds of investments you an pick. If you open a Vanguard account, for example, it locks you into a simple investment strategy, which may or may not be the best fit. Index funds are the best if you want investments that have the lowest time commitments, plenty of diversification, and aren’t trying to beat the market. For most people, this is a great strategy to use. 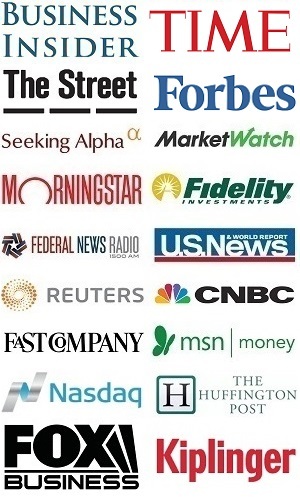 Platforms like Vanguard, Betterment, Wealthfront, or M1 Finance are among the best here. If you want a slightly more hands-on approach, then dividend growth investing can be a viable strategy. With this buy-and-hold type of strategy, you could potentially reduce your fees to even lower levels than index funds, while building the most reliable growing dividend income streams. The trade-off is that it takes more time, and is more prone to human error. If this is what you’re after, then opening up an account with a quality online broker is the way to go. Look for ones that have low fees and good research options. Robinhood and M1 Finance are simple and free. Fidelity and Charles Schwab are good options with low fees and plenty of extra features. Lastly, pick which investments you want to make. This is the part that could be the hardest, but it doesn’t have to be. If you want to stick with the simplest of hands-off investing in diversified index funds, I have a set of sample investment portfolios you can use as a starting point. My free investment newsletter keeps readers up to date with what I personally own, and what I’m buying and selling and why, if that’s of interest to you.